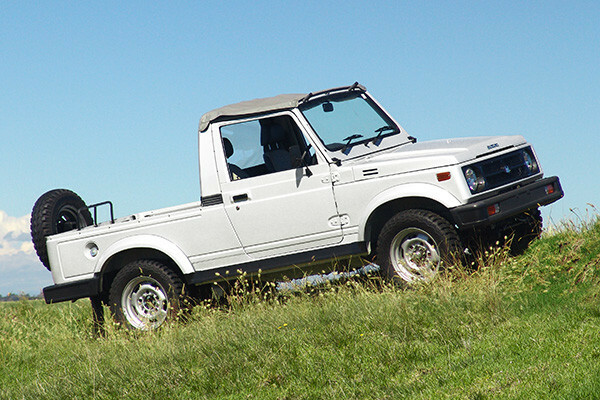 Portland, OR – The Suzuki Samurai was introduced to North America in 1985 as a MY 1986 vehicle and was on sale for 10 model years. Despite the whole Consumer Reports roll-over conundrum in the 1980s, it remains one of the most loved, coveted, and in-demand 4x4s out there. Don’t believe me? Look at how much they go for on craigslist. Its off-road ability and subcompact size make it great for tackling all sorts of terrain; its reputation for durability and off-road capability is legendary. In fact, it’s still one of the more popular platforms around the world for those looking to venture off the pavement. And although the Samurai eventually evolved as the Jimny in many markets, there are still a couple places you can buy a brand-new version: India and New Zealand. While Suzuki pulled out of the North American markets in 2013, it’s the number one automotive brand in the rapidly developing country of India. There, Suzuki is known as Maruti Suzuki, which is the Indian subsidiary of the Japanese auto manufacturer. It is in India where you can buy a brand-new Maruti Suzuki Gypsy—essentially a brand-new long-wheelbase Samurai—and it’s as durable, capable, and Spartan as ever. According to the Maruti Suzuki website, features include a driver’s side rear view mirror, a spare wheel cover, a foldable front windscreen, and windshield washer and 3 speed wiper—oh the luxury. It also has a fiber reinforced plastic / removable canvas top. It’s like 1986 all over again, minus acid-washed jeans. The Gypsy is powered by the fuel-injected 1.3-liter four cylinder GB13BB engine, which was last seen in North America under the hood of the Geo/Chevy Metro. It makes 80 hp and 76 ft/lbs. of torque and is put through a five-speed manual gearbox mated to a two-speed transfer case with low range. It still rides on leaf springs and solid axles, still has 205/70/15 tires on steel wheels. Just like a Samurai, the Gypsy has a total of zero airbags. That being said, it’s super capable on bad terrain, decent on fuel, and likely dead-nuts reliable. I mean, they’ve had 30+ years to prefect it, right? So how much does it cost? Just under 60,000 rupees (with metallic paint) or about $8,736 USD. At that price, I’d take two. FYI, the Gypsy is made in India. The island nation of New Zealand is one of the other places on earth where you can buy a new Samurai, although there it’s now called the Farm Worker. Interestingly, the Farm Worker was reintroduced into New Zealand in 2013, and is simply a rebadged Maruti Suzuki vehicle. Unlike the Indian market Gypsy, however, the Farm Worker has a pickup-style configuration with a fiberglass bulkhead that houses a rear window. It also only has a canvas roof. Otherwise, it’s mechanically the same as its Indian acousin. Unlike the Gypsy, the Farm Worker is intended for farm use only, and cannot be registered for road use due to the lack of safety features. Kiwis looking for a road-legal 4×4 Suzuki will have to go with the more modern Jimny, which is not a bad choice, and still rides on solid axles. Despite the fact that these vehicles can be purchased new, they’re still rough-riding, basic transportation. Granted, they’re awesome on unpaved roads (and on no roads at all). Autocar India said of the Gypsy, “There is nothing that can touch a Gypsy off the road, except perhaps an Arjun battle tank.” We’re guessing the tank rides about the same. About the Author: Andy Lilienthal, Editor In Chief of Subcompact Culture Blog and Suzuki 4×4 enthusiast. Subcompact Culture is all about small cars. This includes subcompacts, compacts, micro cars, and more. Heck, even some vehicles that are a bit bigger. From news and reviews to cars shows and project vehicles: Subcompact is the small car blog. I understand not being able to import these vehicles but why can’t you import new motors or transmissions? They are right hand drive. And no, you can’t import them in to the US. Good to know. Thanks for the write up. 1) Are these left or right hand drive? 2) Are they easy to import and title in USA?